Coral has been public for about a month now, and we’ve heard some great feedback about our products. As we evolve the Coral platform, we’re making our products easier to use and exposing more powerful tools for building devices with on-device AI. Today, we're updating the Edge TPU model compiler to remove the restrictions around specific architectures, allowing you to submit any model architecture that you want. This greatly increases the variety of models that you can run on the Coral platform. Just be sure to review the TensorFlow ops supported on Edge TPU and model design requirements to take full advantage of the Edge TPU at runtime. We're also releasing a new version of Mendel OS (3.0 Chef) for the Dev Board with a new board management tool called Mendel Development Tool (MDT). To help with the developer workflow, our new C++ API works with the TensorFlow Lite C++ API so you can execute inferences on an Edge TPU. In addition, both the Python and C++ APIs now allow you to run multiple models in parallel, using multiple Edge TPU devices. In addition to these updates, we’re adding new capabilities to Coral with the release of the Environmental Sensor Board. It’s an accessory board for the Coral Dev Platform (and Raspberry Pi) that brings sensor input to your models. It has integrated light, temperature, humidity, and barometric sensors, and the ability to add more sensors via it's four Grove connectors. The secure element on-board also allows for easy communication with the Google Cloud IOT Core. Finally, we’re expanding our distributor network to make it easier to get Coral boards into your hands around the world. This month, Seeed and NXP will begin to sell Coral products, in addition to Mouser. We're excited to keep evolving the Coral platform, please keep sending us feedback at coral-support@google.com. You can see the full release notes on Coral site. This entry was posted in Google Developers Blog and tagged AI, AIY, AIY Projects, artificial intelligence, Coral, Edge TPU, Edge TPU Dev Board, Google Coral, IoT, machine learning, machine learning accelerator, Maker, prototype, TensorFlow, TensorFlow Lite on April 11, 2019 by Google Developers. AI can be beneficial for everyone, especially when we all explore, learn, and build together. To that end, Google's been developing tools like TensorFlow and AutoML to ensure that everyone has access to build with AI. Today, we're expanding the ways that people can build out their ideas and products by introducing Coral into public beta. 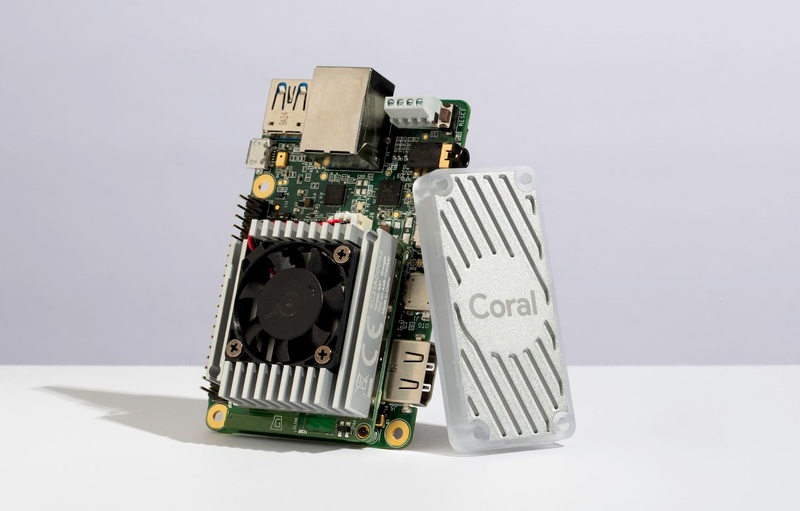 Coral is a platform for building intelligent devices with local AI. Coral offers a complete local AI toolkit that makes it easy to grow your ideas from prototype to production. It includes hardware components, software tools, and content that help you create, train and run neural networks (NNs) locally, on your device. Because we focus on accelerating NN's locally, our products offer speedy neural network performance and increased privacy — all in power-efficient packages. To help you bring your ideas to market, Coral components are designed for fast prototyping and easy scaling to production lines. Our first hardware components feature the new Edge TPU, a small ASIC designed by Google that provides high-performance ML inferencing for low-power devices. For example, it can execute state-of-the-art mobile vision models such as MobileNet V2 at 100+ fps, in a power efficient manner. For new product development, the Coral Dev Board is a fully integrated system designed as a system on module (SoM) attached to a carrier board. The SoM brings the powerful NXP iMX8M SoC together with our Edge TPU coprocessor (as well as Wi-Fi, Bluetooth, RAM, and eMMC memory). To make prototyping computer vision applications easier, we also offer a Camera that connects to the Dev Board over a MIPI interface. To add the Edge TPU to an existing design, the Coral USB Accelerator allows for easy integration into any Linux system (including Raspberry Pi boards) over USB 2.0 and 3.0. PCIe versions are coming soon, and will snap into M.2 or mini-PCIe expansion slots. When you're ready to scale to production we offer the SOM from the Dev Board and PCIe versions of the Accelerator for volume purchase. To further support your integrations, we'll be releasing the baseboard schematics for those who want to build custom carrier boards. Our software tools are based around TensorFlow and TensorFlow Lite. TF Lite models must be quantized and then compiled with our toolchain to run directly on the Edge TPU. To help get you started, we're sharing over a dozen pre-trained, pre-compiled models that work with Coral boards out of the box, as well as software tools to let you re-train them. 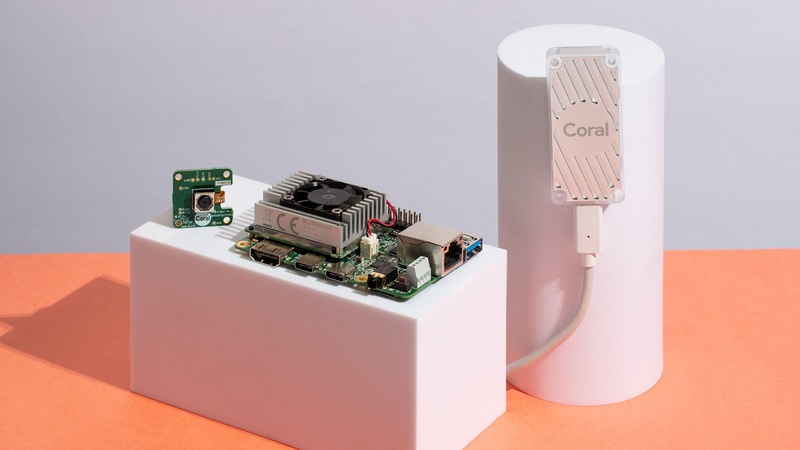 For those building connected devices with Coral, our products can be used with Google Cloud IoT. Google Cloud IoT combines cloud services with an on-device software stack to allow for managed edge computing with machine learning capabilities. Coral products are available today, along with product documentation, datasheets and sample code at g.co/coral. We hope you try our products during this public beta, and look forward to sharing more with you at our official launch. This entry was posted in Google Developers Blog and tagged AI, AIY, artificial intelligence, Coral, Edge TPU, Edge TPU Dev Board, Google Coral, IoT, Machine Intelligence, machine learning, machine learning accelerator, Maker, prototype, TensorFlow, TensorFlow Lite on March 6, 2019 by Google Devs.